Willow Grace: Why is Yellowstone called Yellowstone? 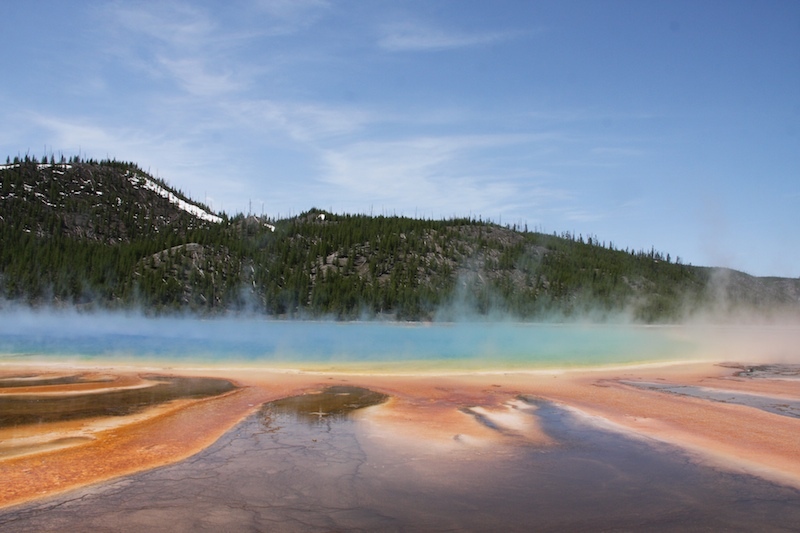 Why is Yellowstone called Yellowstone? Jimmy said "Do you think this is why it's called Yellowstone?" Well, we don't know for sure, and I'm waay too tired to look it up right now, but it does seem pretty obvious that's why it's called Yellowstone, right? 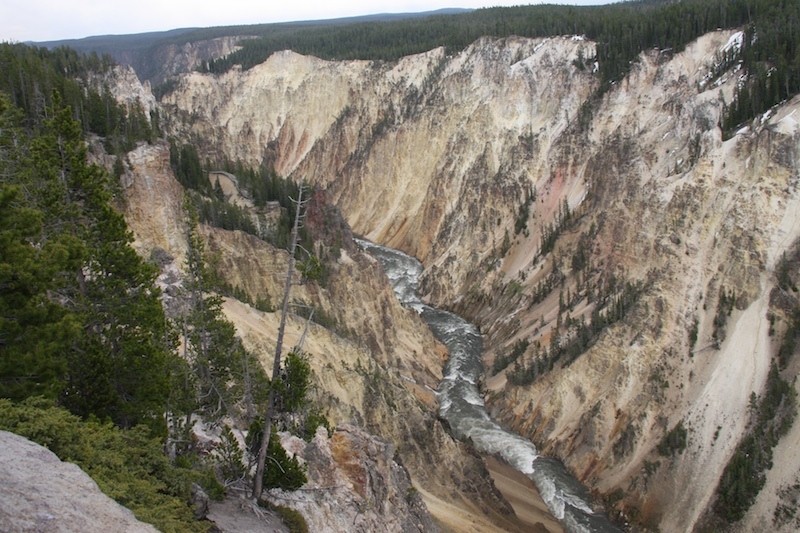 The Yellowstone waterfall is in the Grand Canyon part, too. 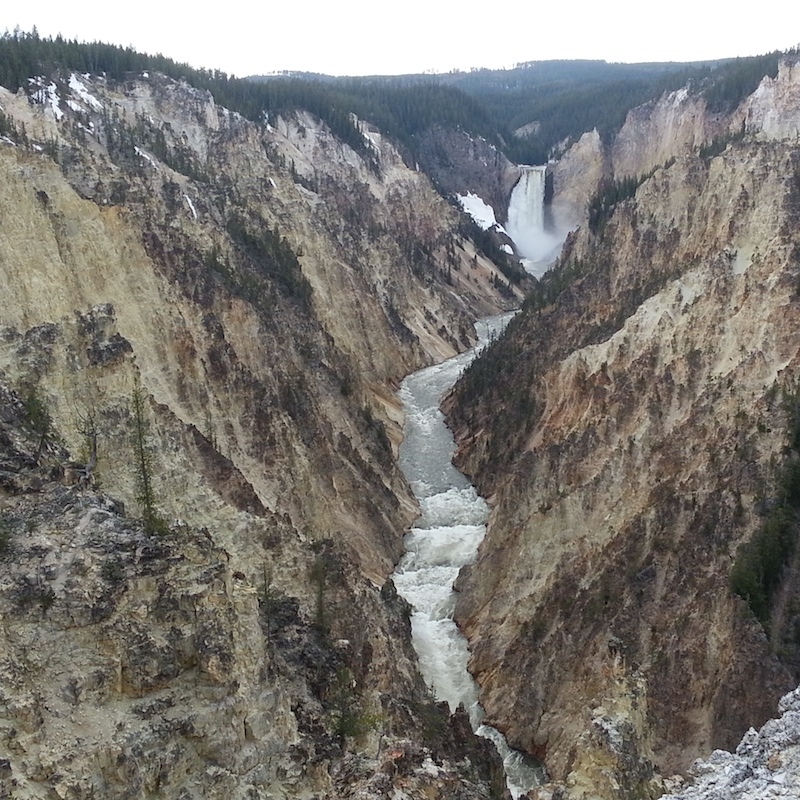 That's the Yellowstone River carving its way though the canyon. It's much more yellow than it appears in those photos. It was a very cloudy day. In fact, we had a downpour within a few minutes after getting back in the car. But the canyons are also orange, pink and brown. But the dominate color is yellow. We saw a lot more stinky geysers and springs today, too. 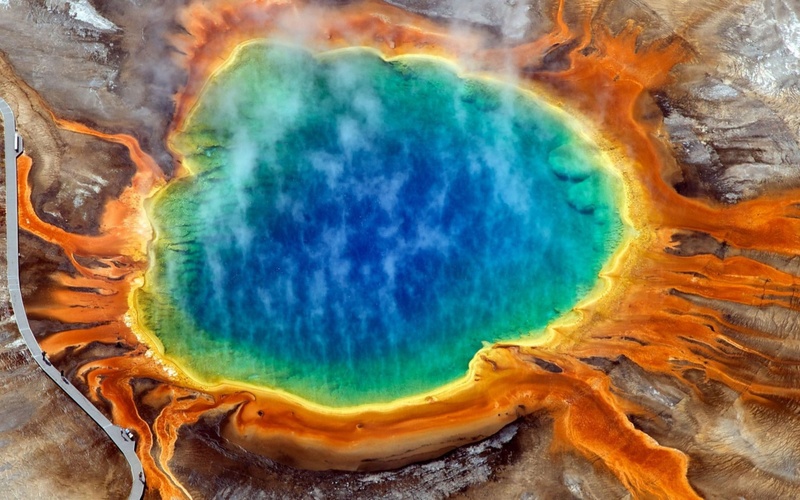 The Midway Geyser Basin had 2 of the biggest and probably the most beautiful spring. You can't tell from my photo here, but this Grand Prismatic Spring was breathtaking, even though we could only see it from the side. Interestingly, the steam that was coming off it reflected the blues, greens, yellows and oranges of the geyser. I got this image from here. But this day wasn't just about the land. We saw even more wildlife today. Within 20 minutes of entering the park, we saw a bunch of people pulled off the side of the road. That's always a huge clue that something's been spotted. Jimmy said "Unless it's a bear, we should keep going, we've got a lot to see today." In other words, if it's just bison, we won't stop. Which after you've been here for a day or 2, you realize how many there are, you will see them everywhere! Well, low and behold, it was a bear!! We stopped just in time to watch it walk up a steep hillside before disappearing from sight. By the way, this may look like a brown bear, but it's called a black bear. 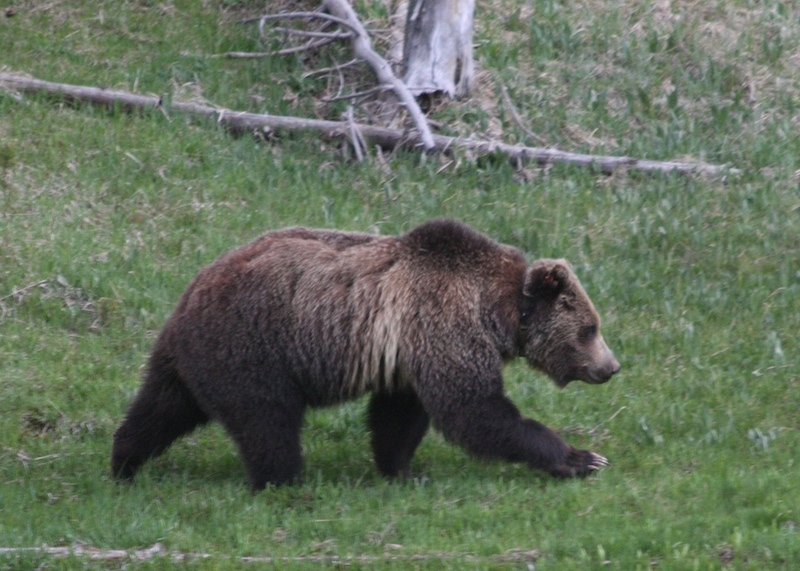 Because grizzly bears are also called brown bears. That's not at all confusing, is it? 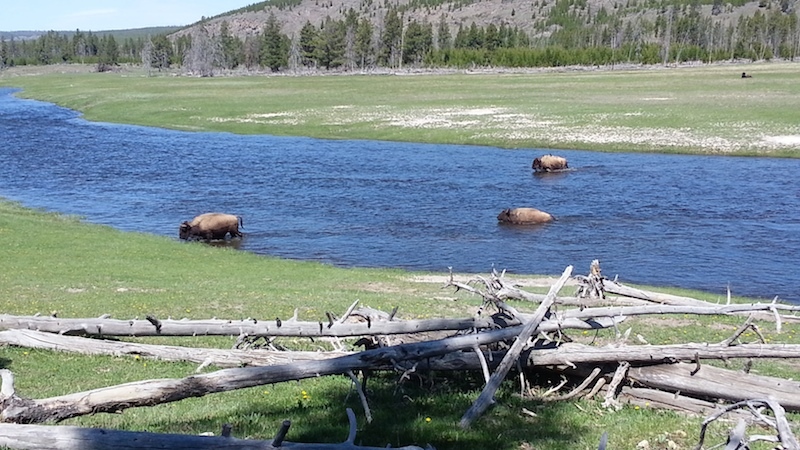 Watching bison cross a river is definitely worth stopping for and watching. That was super cool. 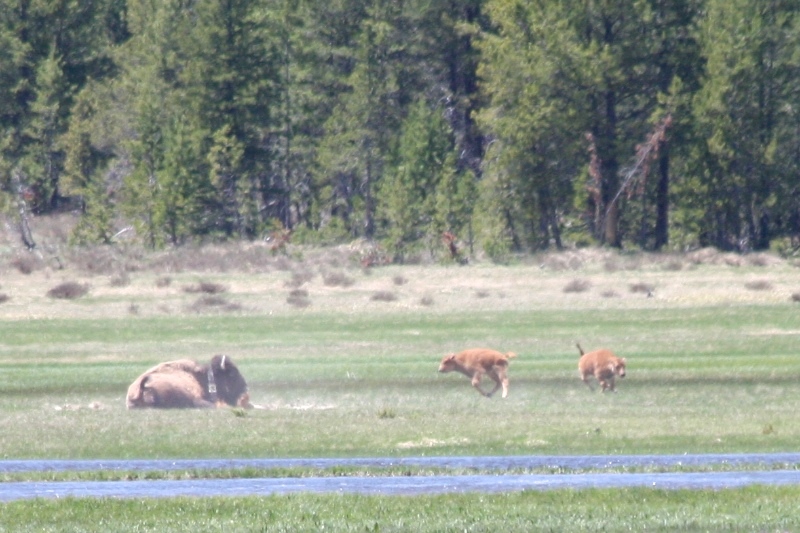 And watching baby bison run around and play was also worth stopping for and watching for 10 minutes or so. They were kicking up a lot of dirt running around and chasing each other. It was absolutely adorable! 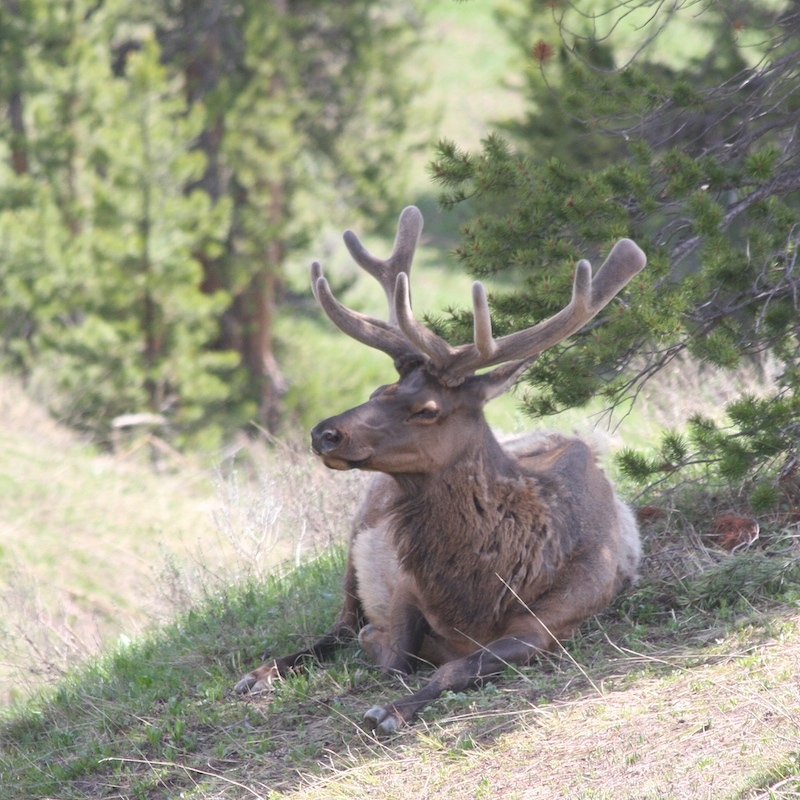 We saw a lot of elk, too. But this was the only one we saw that had a full big rack of antlers. He's looking pretty regal, isn't he? 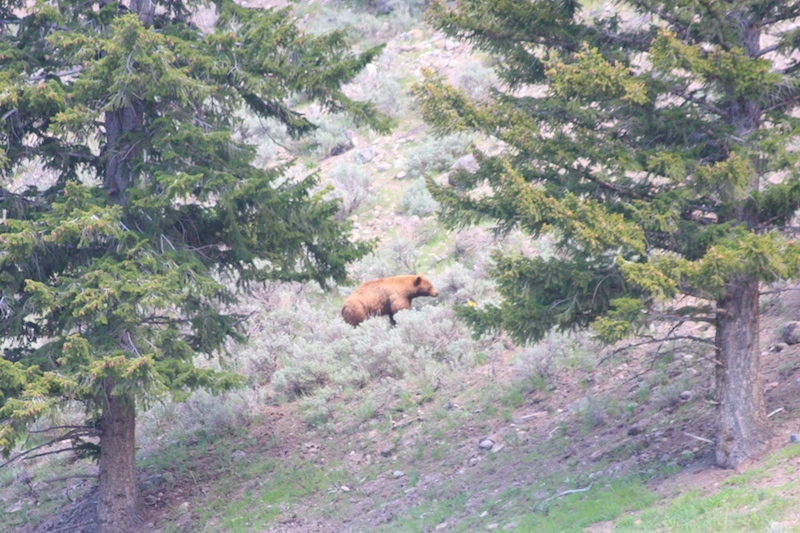 Now that is a grizzly bear! He was huge and just walking along, practically oblivious to the cars and the construction around him. 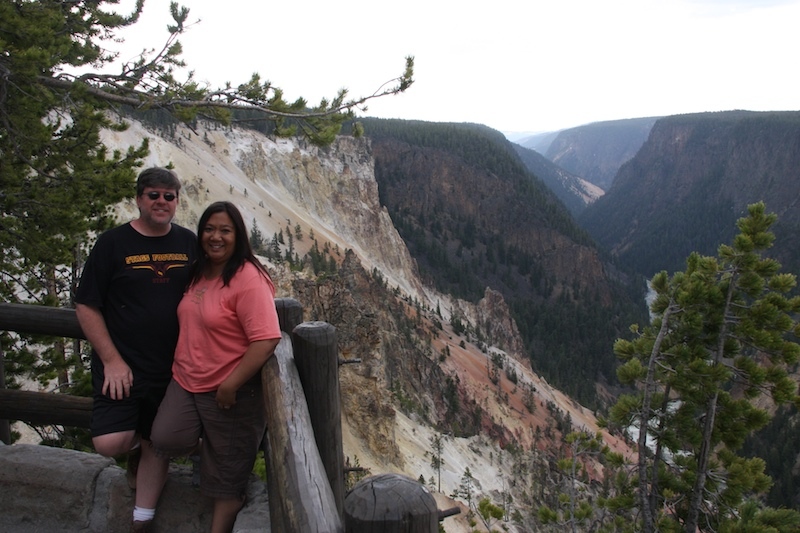 We were in Yellowstone for 10 hours on our 2nd day in Yellowstone, and going the whole time. We even brought lunch with us to eat while viewing the sights. And tomorrow's adventure starts at 4am! You're posting such amazing pictures! I didn't know about the yellow stone, and it looks really yellow. How close were you to the grizzly bear?